Is it time to consider replacing your home siding? For many homeowners, fall is the perfect opportunity to ensure their house’s exterior is prepared for the harsh winter weather ahead. As a part of regular fall maintenance, it’s important to clean your gutters and prepare your chimney for winter. But homeowners often neglect to check if their siding is ready to upstand snow, ice and wind. There is a difference between needing siding repairs and siding replacement. It can be difficult to know the difference. If your siding has simple cracks or minor hail damage, it may be a simple repair job for a local contractor. However, if these cracks have been there for some time, it could mean water has gotten under the siding. This can cause problems you won’t immediately see and may require full siding replacement. Another thing to consider is how old your siding is. If it’s decades old, it could be more cost effective to replace all of it rather than doing piecemeal projects that can add up down the line. It can also be difficult to match the color of outdated siding. To help make this decision, invite a siding contractor to your home to do an inspection. They can help you identify problem areas and the most effective way to protect your home. Many contractors, including ours, do free estimates and will answer any questions you have before the project gets started. Is the timing right to do a siding replacement? Believe it or not, the time of year you decide to replace your home siding could impact its cost. Many siding materials shouldn’t be installed in extreme heat or cold. Moderate temperates are usually best, making Spring and Fall the perfect seasons to do this type of project. You should also consider other upcoming projects your home may need. How old is your roof? Are your gutters aged? What about your home’s shutters? Discuss these with your home contractor. Many experts recommend taking care of roof replacements first then moving to siding replacements. Doing them at the same time could reduce your overall costs. Will my insurance cover my siding replacement? It’s always helpful when insurance will aid with the cost of home projects. For some homeowners, siding replacement is covered under insurance. However, these are typically extreme situations of damage caused by storms or fallen trees. If your siding has been damaged as a result of weather, it’s important to call a contractor immediately to help identify damages that an adjuster may not see or know to look for. Your insurance adjuster will need documentation of any and all damages. A knowledgeable contractor will help confirm that this damage is linked to recent storms. Should I hire a professional to replace my siding? We all love saving money; many homeowners may want to reduce costs by trying to replace siding on their own. Sure, you might have a master plan to start with, but we’ve seen our fair share of home renovations gone wrong. Siding replacement can be complicated and often requires special tools to complete the job. There are many advantages to hiring a professional siding contractor. And if you hire the right contractor, you really do get what you pay for. yourself. Nowadays, there are an array of great siding materials to choose from. It can be overwhelming to decide which material and color is a right fit for your home and budget. Trusted contractors, like ours at Bloomfield Construction, know the ins and outs of effectively managing this type of project. We’re masters of things like where to purchase the best materials at affordable prices. Also, we know how to ensure joints hit studs, how to ensure the siding doesn’t leak and ways to ensure your new siding doesn’t buckle when completed. What are my siding material options? Great question. 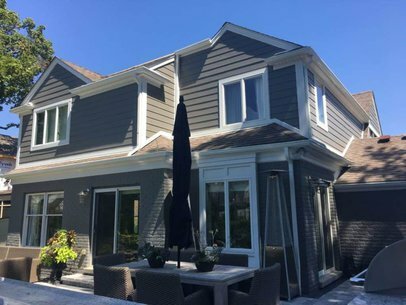 At Bloomfield Construction, we have an array of siding materials to refresh your home’s exterior. We offer vinyl and aluminum trim, cedar lap and cedar shakes, stucco panels, and James Hardie products. Not sure which is right for your home? No problem! One of our sales engineers will walk you through each option, work with you to determine your budget and help you select the best siding for your home. What color siding should I get? One of the great things about siding replacements is their ability to completely transform a home’s appearance. We love watching the progress of siding projects and how the new siding can immediately elevate the home’s curb appeal. In fact, siding replacements are among the best investments in a home, increasing the home’s value and making it more attractive to buyers. The color you select can be a big component of that attraction. When deciding your new siding’s color, first take a look around your neighborhood. What colors do you see? If your neighbors all have gray and blue homes, do you want to be the striking yellow house on the block? Maybe so, and that’s okay, but it’s a choice you’ll need to make. Are you replacing your roof, shutters or gutters? Consider how siding options complement each of these aspects of your home. If you live in an area with a homeowner’s association, you may also need to consider any rules they have. The materials you select for your siding may also help determine which color option will work best. 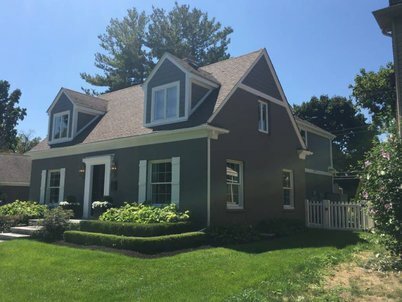 Selecting your siding color can be one of the most exciting parts of the project. Get creative and have fun with it! Are you ready to talk about your siding replacement? We’d love to help!